Walter Grutchfield - Emsig Manufacturing Co.
Faintly in the gray space above the windows the letters EMSIG. There is a clearer, smaller sign on the door (click for image). The Emsig Manufacturing Co. manufactured buttons. In 2002 they were cited as "the nation's largest maker of buttons - an old but little-known giant of the garment industry" (New York Times, 3 March 2002). The founder of Emsig was Max Emsig (1884-1976), a tinsmith, born in Rakowiec, Austria, who immigrated to the U. S. in the early 1900s. (Rakowiec is a town near Chernovitz in Galicia (now the Ukraine).) Max Emsig's first appearance in New York city directories is in partnership with Morris Schorr in 1918 doing business as Clinton Guarantee Roofing Co. at 347 E. 4th St. This partnership seems to have ended in the late 1920s, when "M. Emsig, roofing, sheet metal" appeared at the same address. In 1932 the roofing business became Emsig Manufacturing Co. at 629 E. 16th St. By 1940 Emsig Mfg. was also known as the Emsig Button Co. The business moved to 225 W. 60th St. in 1944. In 1955 sales of plastic buttons amounted to $3,000,000 wholesale, and the business turned out more than 6,000,000 buttons a day. An article in the New York Times, 17 June 1956, p. 150, describes in some detail their manufacturing process for buttons. Emsig continued to be listed in the Manhattan telephone directory at 225 W. 60th St. through 2002. However, a fire here in 1986, prompted Emsig to open a new factory in Hudson, N. Y. The factory in Hudson, N. Y., itself closed in 2001 due to a downturn in business. Max Emsig was followed into the business by his sons, Sidney Emsig (1908-1984), Jacob (Jake) Emsig (1911-1999), and his son-in-law, Joseph Sucher (1913-1988). In 2008 Lawrence Jacobs was listed as president and treasurer. 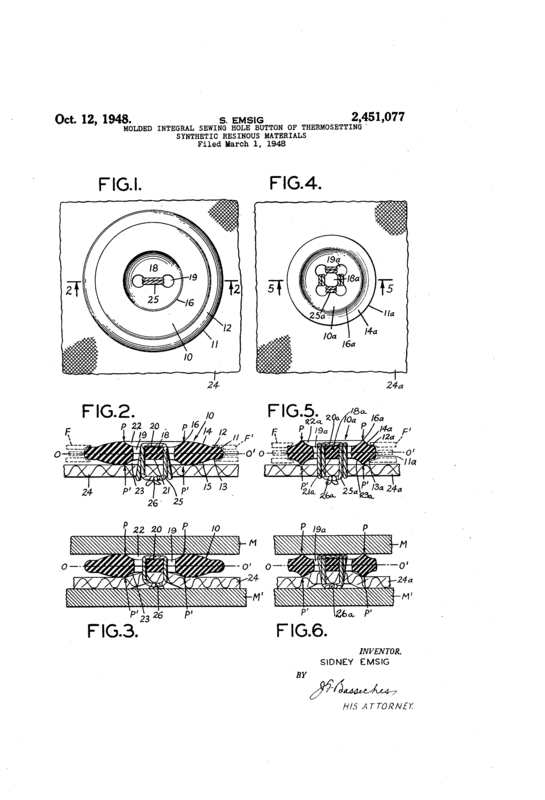 In 1948 Sidney Emsig secured a patent (2,451,077) for a "Molded Integral Sewing Hole Button of Thermosetting Synthetic Resinous Materials." 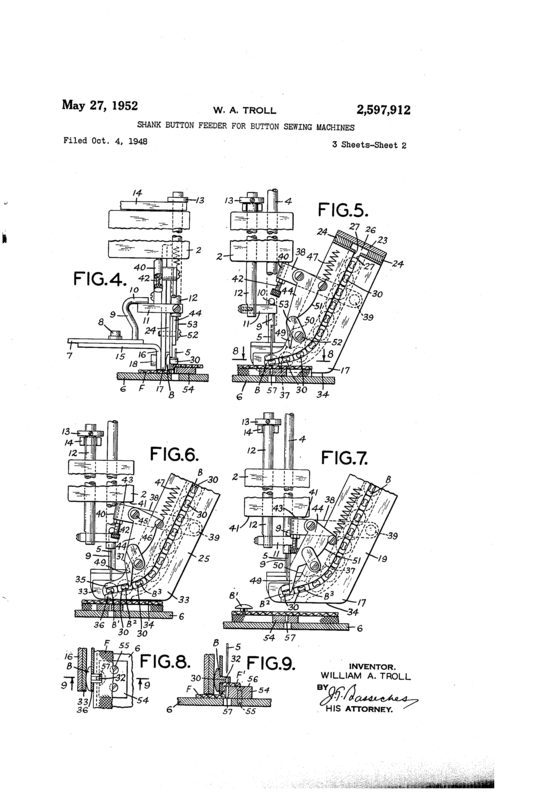 In 1952 a patent (2,597,912) for a "Shank Button Feeder for Button Sewing Machines" was assigned to Emsig Mfg. Co. These patents were cited in 1957 when Emsig charged Rochester Button Co. and others with infringement of patent rights in the manufacture and sale of plastic buttons (Women's Wear Daily, 23 Jan. 1957). 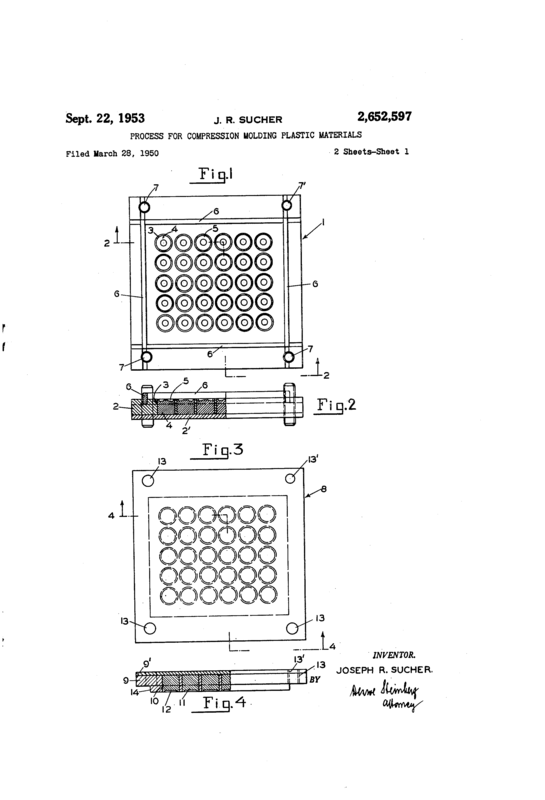 In 1953 Joseph R. Sucher secured a patent (2,652,597) for a "Process for Compression Molding Plastic Materials." Emsig's plastic buttons were marketed under the trademark Permaloid, registered in December 1957, citing first use in commerce 15 March 1939. An earlier Permaloid trademark registration in 1947 listed the registrants as Emsig Manufacturing Company composed of Max Emsig, Sidney Emsig, Jack Emsig, and Joseph Sucher. 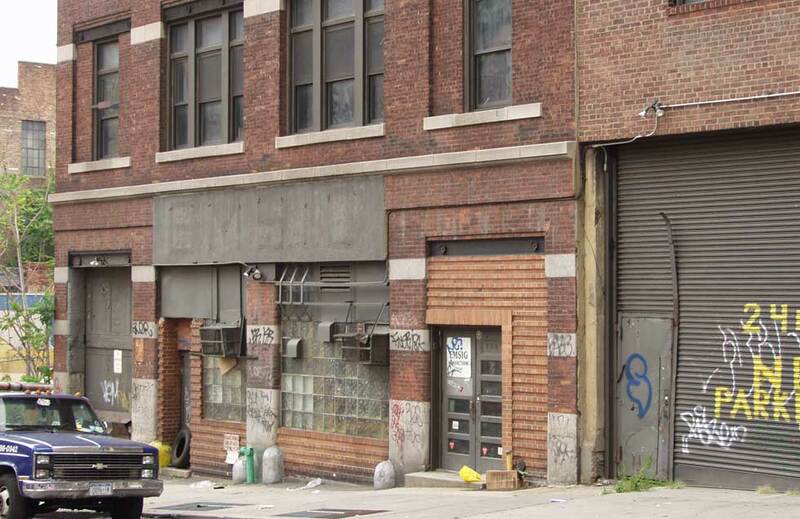 As of March 2009 Emsig was listed on internet resources at 253 W. 35th St., Manhattan, and 1040 45th Ave., Long Island City. The product line included belts, buckles and novelties as well as buttons.